Comet 300021A. Cam Spring for 500/858 Series Driven Clutch, Green. Comet 300021A. 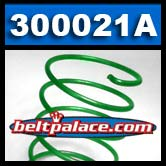 Cam Spring for 500/858 Series Driven Clutch, Green, provides 142lbs Tension. Replaces select Comet 770/780 Driven unit cam springs: 302649C, 301796C, 300782C, 301940C. Left Hand Wound for INBOARD Mount only!